This article was last updated Dec 14, 2018, but some terms and conditions may have changed or are no longer available. For the most accurate and up to date information please consult the terms and conditions found on the issuer website. With myriad ways to redeem credit card points, sometimes you may find yourself coming up a little short of enough points for your booking. When that happens, know that there are hotel-branded credit cards that will let you pay with a mix of loyalty program points and cash. It’s a win-win because you can use your points and still score a good deal on your room. Determining the value of your hotel points is subjective, said Brian Karimzad, vice president of research at LendingTree, the parent company of CompareCards.com and an expert in points and miles. “It’s based on looking at hotel point prices and values for select large cities and resort destinations. It’s more an art than science,” he said. We’ll take a look at which hotel cards offer a cash-and-points option under their loyalty programs and how it works using valuations created at MagnifyMoney.com. MagnifyMoney is owned by LendingTree, which also owns CompareCards. And we’ll offer short reviews on hotel credit cards that can help you earn and redeem points for room nights and link to other credit cards with cash and points options. IHG is home to popular hotel brands including Intercontinental, Kimpton, Crowne Plaza, Staybridge Suites and Holiday Inn, with 5,518 properties around the world. Once you join the IHG® Rewards Club, you can redeem between 10,000 and 70,000 points per room night. For example, a two-night December stay in Miami can cost from a low of 15,000 points at the Holiday Inn Express & Suites Miami-Hialeah to a high of 60,000 points for the Kimpton Angler’s Hotel South Beach in Miami. At least 5,000 points are needed in your account in order to use IHG’s Points & Cash program. Most IHG® Rewards are worth $0.40 per point. IHG® Rewards Club also offers more value with its PointBreaks awards program, where you can book from a rotating list of hotels at 5,000 points a night. The catch? Those hotels tend to be in less popular destinations during less desirable travel dates. When you’re ready to book, go to the IHG® Rewards Club website, choose your location and travel dates. We chose Miami for Dec. 5-8, because who doesn’t need a long, warm weekend before the holidays? After hitting search, your list of hotels will appear. At the top right side of the page, click on “Points + Cash.” It will then show how much each will cost with a mix of points and cash. We chose the Holiday Inn Miami Beach-Oceanfront. The location is right on the beach with good amenities, but it doesn’t cost a small fortune for a stay. The regular room rate was $328 or 40,000 points per night. With points and cash, the number of points required dropped to 30,000 plus $70. This is the card you want if you’re loyal to IHG brands and want to maximize your benefits in the IHG® Rewards Club. New cardmembers Earn 80,000 bonus points after spending $2,000 on purchases within the first three months of account opening plus an additional 40,000 bonus points after spending a total of $5,000 on purchases within 6 months of account opening, enough for a one-night stay at a luxury category hotel. Earn 10 points per $1 spent when you stay at an IHG hotel. Earn 2 points per $1 spent on purchases at gas stations, grocery stores, and restaurants. Earn 1 point per $1 spent on all other purchases. Cardmembers are automatically upgraded to IHG® Rewards Club Platinum Elite status for as long as you carry the IHG® Rewards Club Premier Credit Card. Benefits include a dedicated customer service phone number, free room upgrades, guaranteed room availability, priority check-in and extended check-out, free internet access, a welcome amenity and a $30 in-room spa credit. There’s a 20% discount when you buy points with the card. Not only do you get a free night after each card anniversary year at IHG hotels worldwide, but you also get a free night anytime you redeem points for stays of four or more nights. Check out our review of the IHG® Rewards Club Premier Credit Card. Hilton offers 15 brands — including Waldorf Astoria, Conrad Hotels, Hilton, Doubletree, Embassy Suites and Hampton by Hilton — comprising more than 5,500 properties with nearly 895,000 rooms in 109 countries and territories. Points are valued at 0.4 cents. Members of this loyalty program have access to the Points & Money option. While Hilton doesn’t have a rewards chart, it does give you flexibility on points pricing, depending on supply and demand. So a check on Nov. 12, 2018, found a maximum rate of 70,000 points for the Hilton Garden Inn Times Square Hotel in New York. Once you have at least 5,000 points, you can log into your Hilton Honors account and type in your location and dates. After perusing the available hotels, select the one you want, then choose your room type. Below, we chose a room with a queen bed using a standard room reward. After choosing a room, a slider will appear, showing you what your options are. Below is an example of how much the Hilton Garden Inn Times Square room would cost at full price and with Points & Money. 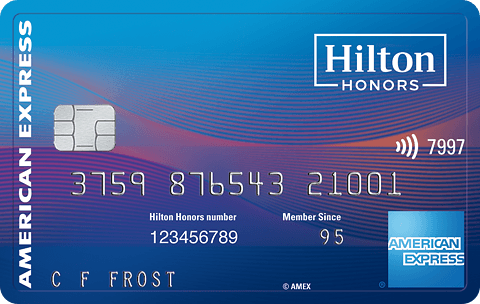 Hilton Honors offers three credit cards — Hilton Honors American Express Card, Hilton Honors American Express Ascend Card and the Hilton Honors Aspire Card from American Express — but we’ll focus on the Hilton Honors American Express Ascend Card, since it offers a good way to maximize your Hilton Honors benefit for a reasonable annual fee of $95. New cardmembers earn 125,000 Hilton Honors Bonus Points with the Hilton Honors American Express Ascend Card after you use your new Card to make $2,000 in eligible purchase within the first 3 months of Card Membership. Those welcome offer points are more than enough for a free room night at your choice of Hilton-branded properties. The rewards with this card are quite generous, especially for hotel stays. Earn 12X Hilton Honors Bonus Points for each dollar of eligible purchases charged on your Card directly with a hotel or resort within the Hilton Portfolio. Earn 6X Hilton Honors Bonus Points for each dollar of eligible purchases on your Card at U.S. restaurants, U.S. supermarkets, and U.S. gas stations. Earn 3X Hilton Honors Bonus Points for all other eligible purchases on your Card. The card comes with free Hilton Honors Gold status, which includes a guaranteed member discount, 80% tier bonus points per hotel stay, no resort fees on reward stays, late check-out, fifth standard reward night free, two bottles of water and free breakfast. If you spend $40,000 on the card in a calendar year, you earn Hilton Honors Diamond status through the end of the next calendar year. Hyatt has a portfolio of 14 hotel brands and more than 750 properties in more than 55 countries across six continents. Those brands include Grand Hyatt, Hyatt Regency and Hyatt Place. Hyatt’s points are valued higher, at 1.25 cents, as it doesn’t have as many hotels in its portfolio as its competitors. World of Hyatt members can use the Points + Cash option to book room nights. But unlike other hotel programs, members must have 50% of the points needed for a free night and 50% of the Standard Rate. A stay at the Category 1 Hyatt Place Phoenix-North would cost 5,000 points per night or 2,500 points plus 50% of the standard room rate, at $87 a night for a Dec. 5-8 stay. Below is a chart listing the seven categories of hotels, along with the number of points and points/cash it takes to book a room. This card, with a $95 annual fee, allows new cardmembers to Up to 50,000 Bonus Points. Those bonus points are enough to snag you a three-night stay at the Mandalay Bay in Las Vegas, a Category 5 hotel. Compared to other hotel credit cards, rewards offered with the The World Of Hyatt Credit Card aren’t as strong. You only Earn 9 points total per $1 spent at Hyatt - 4 Bonus Points per $1 when you use your card at Hyatt hotels & 5 Base Points per $1 you can earn as a World of Hyatt member. Cardmembers receive a free night at any Category 1-4 Hyatt hotel or resort every year after your cardmember anniversary. Earn another free night at the same categories after spending $15,000 during a cardmember anniversary year. The card comes with automatic World of Hyatt Discoverist status. Perks that come with it include premium internet, a bottle of water daily, upgrades to preferred rooms when available, a dedicated check-in area, an extended checkout at 2:00 p.m., waived resort fees on free hotel nights, a 10% discount on room rates (at participating Hyatt locations), and a dedicated reservations line. Check out our review of the The World Of Hyatt Credit Card. Marriott is one of the largest hotel brands in the world, with more than 6,700 properties in 30 brands across 130 countries and territories. Hotels under the Marriott brand includes the Ritz-Carlton, W Hotels, Marriott Hotels, Westin Hotels & Resorts, Sheraton Hotels & Resorts, Gaylord Hotels and Fairfield Inn & Suites by Marriott. Marriott Rewards points are valued at 0.6 cents. Properties range from 7,500 points at a Category 1 hotel such as the Courtyard Chicago Wood Dale/Itasca up to 85,000 points at the Gramercy Park Hotel, New York, a Category 8 property. Under Marriott’s Cash + Points program, members can book a room for as little as $55 and 3,500 points for a standard redemption. After choosing a destination and dates, click the “use points” box, then hit select. We chose the Aloft hotel in downtown Chicago. Scroll down to the Cash + Points option for 12,000 points and $105. This $95 annual fee card lets cardmembers Earn 75,000 Points after spending $3,000 on purchases in your first 3 months from account opening with the new Marriott Rewards® Premier Plus Credit Card! Take those points and spend three nights at the AC Hotel Atlanta Downtown. Earn 6X points for every $1 spent at over 6,500 participating Marriott Rewards and SPG hotels and 2X points everywhere else. There are other cards that are more generous with points per dollar spent on hotels, although points earned outside of hotel purchases aren’t bad. Cardmembers receive a free night award every year after their account anniversary at hotels stay at properties with a redemption level of up to 35,000 points, which covers Category 5 properties. The card comes with silver status, which comes with a 10% bonus points on stays; priority late checkout; a dedicated reservation line; free Wi-Fi; no blackout dates when booking rooms; and exclusive member rates. If you spend $35,000 during your account year, you earn gold status. Check out our review of the Marriott Rewards® Premier Plus Credit Card. Wyndham Hotels & Resorts bills itself as the largest hotel franchiser in the world, with 20 brands across 9,000 hotels in more than 80 countries. Those brands include Wyndham Hotels & Resorts, Days Inn, Hawthorn Suites by Wyndham, La Quinta Inns & Suites, Ramada and Wyndham Grand. Because all of its hotels are available for 15,000 points a night, Wyndham points are valued at 1.3 cents. Under Wyndham Rewards, members can use the go fast redemption option, which allows you to redeem 3,000 points and a discounted rate per night. On the Wyndham Reward site, choose your location and dates of travel. Don’t forget to check the “book with points” box. A list of hotels will come up, including those with the go fast points and cash option. A room at the Wyndham Dallas Suites will cost $96.95 a night plus 3,000 points. This card, with its $75 annual fee, has the lowest sign-up bonus and rewards among all the cards in this review. New cardmembers Earn up to 30,000 bonus points! Earn 15,000 bonus points after your first purchase. Plus, earn an additional 15,000 bonus points after you spend $1,000 on purchases within the first 90 days of account opening. That’s enough for a two-night stay at Wyndham Grand Orlando Resort Bonnet Creek. From there, you earn 5 points per $1 on on eligible purchases for every participating hotel stay, 2 points per $1 spent on eligible gas, utility and grocery store purchases, and 1 point per $1 spent everywhere else. Unlike most cards, this one offers higher points for spending on utilities including telecommunications services, cable, satellite, electric, gas, heating oil and water. The card gives you Wyndham Rewards platinum status with perks including 10 points per $1 spent or 1,000 points on eligible stays, whichever is more; go free award nights with no blackout dates, free Wi-Fi, dedicated member services, early check-in/late checkout; an annual 3,000 bonus points; and rental car upgrades at Avis and Budget. Check out our review of the Wyndham Rewards® Visa® Card. Maybe you want a credit card that offers more flexibility and doesn’t tie you down to one hotel brand. The cards below also allow you to use a mix of points and cash to pay for travel, including hotels. If you don’t have quite enough hotel points to book free room nights, using a mix of cash and points can be a win-win. Those miles don’t go to waste and you can get a solid discount on the cost of the room you book. “Cash and points can make sense if the value you’re getting per point is as good or better than what you would get by using points alone, or if you simply don’t have enough points for a free night using points alone,” said Karimzad.